While there are some sources that state that honey bees do not create damage to structures when creating their abode in buildings, we have done some very extensive research to show that many of the times this is not the case (Pollet, 2002). Honey bees do not chew through wood, stucco, or metal. Structural problems do not occur during the initial entrance of the bees; they occur after at least one week after the bees enter the dwelling. 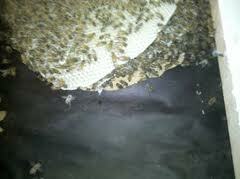 Some of the damage is directly from the bees, while there is other damage from wax moths that target the wax comb. 3-day Hive Building Felt visibly eaten and bees entering behind it. The most significant damage that bees cause is the removal of the moisture barrier, building felt, and vapor barrier in walls. When a bee hive moves into a wall void, it expands very quickly to the point it touches the moisture barrier or building felt. 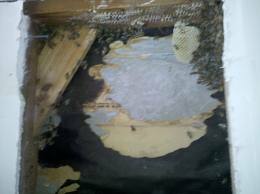 Without a quick removal, the bees will remove this paper by chewing through to the stucco, wood, or whatever surface the wall is constructed of. This can be easily proven in that often beekeepers use paper to temporarily separate two hives that they are combining. Within a few days the paper is eaten through. So it is not uncommon that they chew through paper. As a removalist that removes about 40 bee hives from walls per year and having done this for over 12 years, I have seen this in every situation where the moisture barrier is alongside the hive. This would be consistent for any hive within a wall -since it is code to have a moisture barrier. dead larvae caused mold to grow. Another type of damage that is very well-known occurs when a bee hive dies within a wall, or when the bees cannot cool the hive fast enough. It is very common for bees to have from 20 – 50 pounds of honey in their hives. So, when the bees stop flapping their wings due to a weak hive or dead hive, the outside temperature if hot will cause the hive to melt and the honey will ooze out of the hive and fall and rest on the wood stud below it. After a while this will lead to severe structural damage resultig in mold and dryrot (Needham, 2010). This can cause significant structural damage and absolutely has to be removed and repaired. With the rampant diseases affecting the honey bee, this is a concern. The last type of damage that can be caused by honey bees happens indirectly to their hive. Wax moths are a very common problem for bees. In most cases, wax moths will enter the same hive where the bees are living and live on the surrounding areas of the hive where there are less bees. Usually this is the case where the older part of the hive has been vacated due to a new year of growth. The wax moths will eat the wax and lay their eggs on near the wax. They will attach their eggs often to the wood. As the larvae grows it starts to eat on the wood and finally exits to feed on the wax (Frazier, Caron, & vanEngeldorp, 2011, p. 64). On a hive that has been there for longer than 6 months, one can easily see hundreds of areas where the wax moth larvae have damaged the wood. Moisture is something we all need to have in order to survive, and it’s surrounding us all the time. Unfortunately, it’s also the enemy of a lot of our building materials, and if it gets into the wrong places in our homes and is allowed to remain, it can do a lot of damage. To keep moisture from getting where it doesn’t belong, builders use what are known as vapor barriers. The more you understand about what vapor barriers are and how they work in conjunction with the insulation in your home — especially when you’re doing remodeling and repair work — the more you can do to help prevent moisture problems, like dry rot and mold, from occurring. The barrier keeps moisture from penetrating to the wood. Rain often will penetrate stucco or wood siding, but the barrier keeps it from touching the wood. Remove the bee hive within 6 days of them entering. Call an expert to determine the best removal procedure. Do not exterminate them – that could result in more damage. Frazier, M, Caron, D. vanEngelsdorp, D. (2011). A field guide to honey bees and their maladies. Penn State: College of Agricultural Sciences. www.agsci.psu.edu. Pollet, D.K. P. (2002). Pest management and insect identification series: Removing bees from walls. Louisianna State University Agricultural Center. www.Isuagcenter.com.